National Director of Public Prosecutions Shaun Abrahams speaks during a media briefing in Pretoria, South Africa, May 23, 2016. Abrahams announced he would challenge a court ruling to reopen a 2007 case against Zuma for 783 charges of fraud, corruption and racketeering. South Africa’s President Jacob Zuma may have many problems -- an increasingly raucous parliament, harsh media criticism and sliding popularity ratings amid several scandals -- but if the nation’s top prosecutor has his way, a corruption case won’t be one of them. On Monday, National Prosecuting Authority head Shaun Abrahams announced he would challenge a court ruling to reopen a 2007 case against Zuma for 783 charges of fraud, corruption and racketeering. That decision amounts to support of an embattled president whose popularity has waned during this, his final term. Abrahams said his decision was based on a careful reading of the law, and that he believes that only the prosecuting authority has the right to demand that cases proceed. Before announcing his decision, Abrahams delivered a half-hour treatise in which he discussed the criticism he has faced from media, his own professional backstory, his thought process and methodology, his reading habits, his constitutional obligations, the depiction of his bushy eyebrows in political cartoons -- and the fact that this was a difficult decision to make. FILE - South African President Jacob Zuma answers questions in parliament in Cape Town, March 17, 2016. Zuma’s office did not react to the announcement by late Monday, but the Twitterverse was abuzz with those who were clearly not pleased by Abrahams' decision. “No surprises there!,” said former top union leader Zwelinzima Vavi, who said that he did not expect Abrahams' appeal to succeed. Constitutional law expert Pierre de Vos said he doesn’t, either. “If I was a betting person I would put every single cent I could find on the NPA losing the appeal” in front of the appeals court, he said. The DA had asked the courts to review the decision to drop charges against Zuma, and last month a panel of high court judges unanimously ruled that the case should proceed. This court case is intimately linked to Zuma’s rise to power. The charges date back to a 1999 arms deal. They were originally filed in 2007, and dropped just weeks before the 2009 national election. That decision effectively cleared the way for him to be elected president. 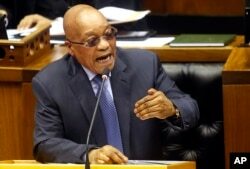 But political analysts Zuma will soon face the real trial of any politician: the polls. The nation holds local elections in August, and analysts predict that Zuma’s sliding popularity will hurt the ruling ANC.